Please find below links to the materials for the Agored-accredited version of the”How to get a great Care and Treatment Plan” course. For links to the non-accredited, in-house certified version of this course please click here. The accredited “How to get a great Care and Treatment Plan” Level One Agored course is designed to give students the skills they need to achieve an excellent Care and Treatment Plan which identifies their needs and sets achievable goals. If you are an Agored-approved centre with your own trainers/assessors and internal verifiers then you can register learners in the normal way with Agored. 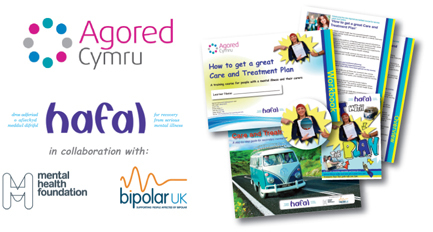 There should be no additional costs as accreditation is free for patients in Wales: the Agored CLRF Registration forms need to be marked with the words ‘Credit for Patients: Mental Health’. Obviously if you are an approved centre (with your own trainers/assessors) but you buy inverification then there will be associated costs. If you are not an approved centre our advice is that you contact approved centres such as a local college and work through options forhow accreditation could be delivered. The Agored website has details of suitable partners. If working with a partner we advise that you do not make assumptions about the timescale for delivery as you will need to negotiate the services you require. The quickest option may be for the college either todeliver the training alongside you or to provide the training for you, but obviously there will be cost implications. Please note that if you would like to become an Agored-accredited centre this is a substantial undertaking and we advise that you discuss it in detail with Agored. Tutors will need to register learners with Agored and provide a copy of the Workbook at least two weeks prior to the training day (Agored will issue individual Learner Numbers; this number shouldbe recorded on page 2 of the Workbook along with other key information). The curriculum units and assessment tracking documents can be downloaded from the Agored Cymru website at www.agored.org.uk and should be used alongside the course materials. evidenced. The course is worth two credits at Level One.